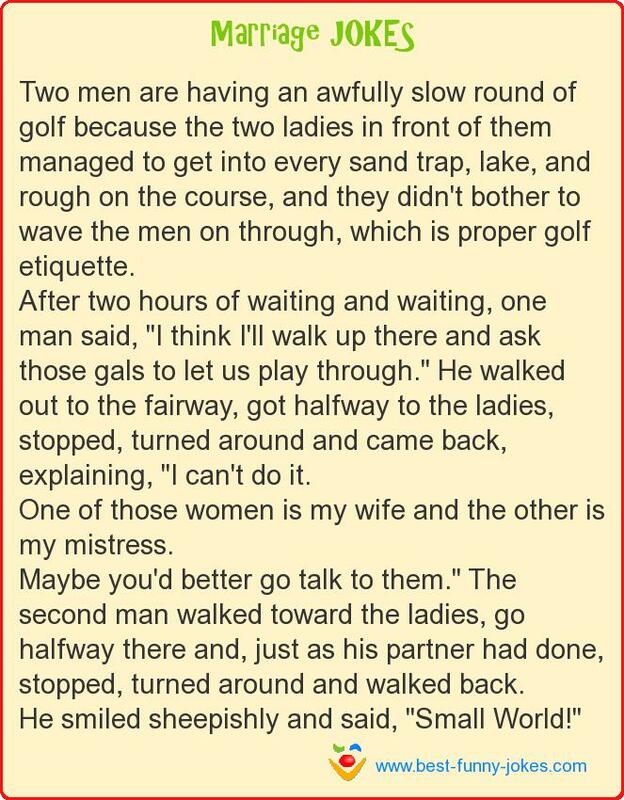 Two men are having an awfully slow round of golf because the two ladies in front of them managed to get into every sand trap, lake, and rough on the course, and they didn't bother to wave the men on through, which is proper golf etiquette. After two hours of waiting and waiting, one man said, "I think I'll walk up there and ask those gals to let us play through." He walked out to the fairway, got halfway to the ladies, stopped, turned around and came back, explaining, "I can't do it. One of those women is my wife and the other is my mistress. Maybe you'd better go talk to them." The second man walked toward the ladies, go halfway there and, just as his partner had done, stopped, turned around and walked back. He smiled sheepishly and said, "Small World!"